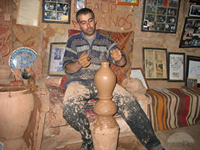 √ On this tour you see essential sights in the central area of Cappadocia. 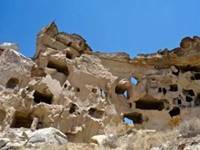 √ This is the most important tour of Cappadocia. √ You can adapt this tour to your interests. SUMMARY: Devrent Valley (Imagination Valley) of strange rock formations, Monks Valley (Pasabaglari) for unique 3–headed fairy chimneys, either Zelve Open Air Museum or Cavusin Castle to see how people lived in caves, Love Valley panorama, Avanos for lunch and local pottery demonstration of an ancient Hittite technique, Goreme Open Air Museum for Byzantine cave churches with beautiful frescos, various panoramic viewpoints of castles and fairy chimneys such as Esentepe for Goreme valley, Uchisar and its castle, Pigeon Valley and Urgup’s family of fairy chimneys. Fully licensed English speaking guide, a/c vehicle, driver, gas, car parking, guide’s and driver’s lunches, tax. 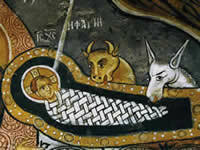 Your lunch, drinks, museum entrances, any personal expenditure, tips. 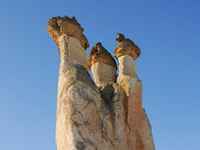 ESENTEPE viewpoint is the best panoramic viewpoint from which to see Goreme Valley. 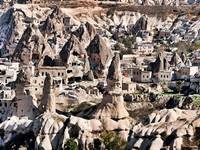 The village is full of fairy chimneys, some of which have been converted into homes by cutting caves out of the soft volcanic rock. 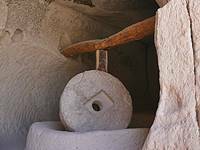 If you are interested, it may be possible to visit a local family’s cave home and see inside one of these fascinating houses. 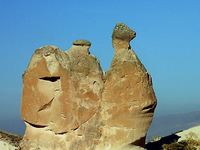 PIGEON VALLEY viewpoint you have a bird’s eye view of the dovecotes carved out of the rocks, the snow capped Mount Erciyes (the mountain that gets bigger the further away you are), as well as a spectacular view of old abandoned fairy chimney cave homes and old Greek houses and UCHISAR CASTLE.